The very best in contemporary concepts and methods, a total dedication to quality, the most up to date components and accessories … all these Showerpower™ elements combine to create pure perfection in glass. Your new made to measure shower enclosure, door, bath or shower screen begins when you provide us with a brief for your project. This should ideally include the approximate dimensions of your shower space and any special requirements that should be taken into account. This will enable us to select the correct products that best suit your installation situation, lifestyle and budget. We will usually give a number of options for your consideration. When the style and configuration of your shower screen has been agreed, we will arrange for a full on-site survey to be carried out. It is important that someone with responsibility to authorise any changes that may be necessary to the initial specification is present. Our survey will include assessing site access and transportation of glass into the target area, wall construction and levels of floor and wall. We will also discuss choice of glass, hardware and component options. 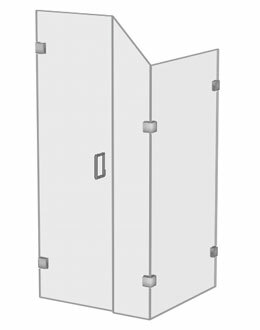 Using our specialist shower enclosure design software, a 3D CAD (computer aided design) visual of your finished frameless shower or bath enclosure is produced for your approval. Crucially this shows the layout of your screen, helping you to see how its proportions will look. Once we have received client approval, your custom-made screen will go into production. As well as working with retail customers we also work with many house builders and refurbishers/renovators. We are accustomed to reading and interpreting the detail and technical complexities of architects’ designs. We will always suggest the most suitable bespoke shower or bath screen for your project. Of course, if your requirement is non-standard, we are in our element. We service numerous high-end builders whose clients’ requirements can be very specific indeed. With our access to a wide variety of components and years of frameless shower enclosure installation and manufacturing experience we can make your clients’ specific ideas and designs come to life. Giving you another unique Showerpower benefit to offer your clients.